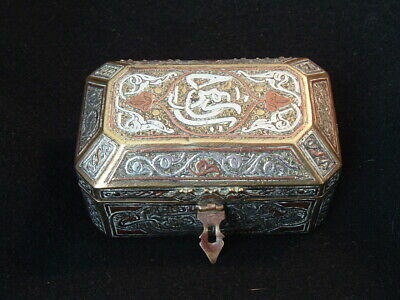 Seller: memberx548976 (1,832) 100%, Location: Brookfield, New York, Ships to: Worldwide, Item: 113682114509 Mamluk CAIROWARE Islamic TRINKET BOX Egypt Middle Eastern UNUSUAL SHAPE This is the first of several type boxes that we will be listing in our "PRE-Estate" Sale. We welcome all questions. Description wood liner with inlaid design; ornate copper & silver caligraphy Very nice design and unuual casket top ID Markings No Style Mamluk, Cairoware Period Mamluk revival Origin Middle East Date Created: circa late 19th Century Medium/Metals Brass; copper & silver overlay Size 4" wide x 2.5" Deep x 2.5" High/ Unusual Casket shape top Condition interior wood liner is loose; Weight 11 ounces SHIPPING: 2 lbs. ship weight BACKGROUND: Sometimes referred to as 'Cairo-ware', these items of brass applied with silver and copper and ornamented with Arabic calligraphy-- a technique that is very popular in the Islamic world: inlaying precious or soft metals into harder metals. This technique originated in Iran, circa 12th Century and its popularity spread throughout the Islamic world. Many fine examples of inlay art were created in Iran, Egypt and Syria during the 13th and 14th centuries, reaching a 'Golden Age' during the Mamluk period (1250 - 1517) when the finest examples where made. 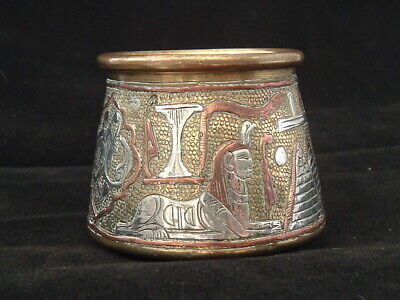 The vessels were manufactured in Cairo and Damascus, and became well known throughout the Islamic world. During the 19th and 20th Centuries, when these items where made, there was a revival of the Mamluk style. Metal smiths and artists looked to emulate the works of the Mamluk period with Muslims, European and people from around the world taking a renewed interest in the Mamluk period. Craftsmen re-interpreted and revived the Mamluk style, inlaying brass with silver, copper, even gold, and taking the work to a new height. These items exemplify the Mamluk revival period. When brass, an ordinary metal, is inlaid with silver in this manner, it creates an impressive piece of craftsmanship. Condition: Vintage and antique items so condition will be commensurate with age. If we are aware of any major defects we will note and see images ...and feel free to ask questions! Popularity - 72 views, 1.7 views per day, 42 days on eBay. High amount of views. 1 sold, 0 available. 1 bid. 72 views, 1.7 views per day, 42 days on eBay. High amount of views. 1 sold, 0 available. 1 bid. Seller - 1,832+ items sold. 0% negative feedback. Great seller with very good positive feedback and over 50 ratings. 1,832+ items sold. 0% negative feedback. Great seller with very good positive feedback and over 50 ratings.